Aim: The aim of this in vitro study was to compare the change in the retentive force and removal torque of three attachment systems during simulation of insertion-removal cycles. Methodology: Edentulous mandibular models were made with heat-cured polymethyl methacrylate resin. Two implant replicas (CMI), of 3.75 mm diameter and 10 mm length, were placed in the intraforaminal region. Acrylic resin mandibular overdentures were fabricated and provision was made to receive three different overdenture attachment systems, prefabricated ball/o-ring attachment (Lifecare Biosystems, Thane, India), Hader bar and clip attachment (Sterngold, Attleboro, MA), and Locator ® implant overdenture attachment stud type (Zest Anchors LLC, USA). 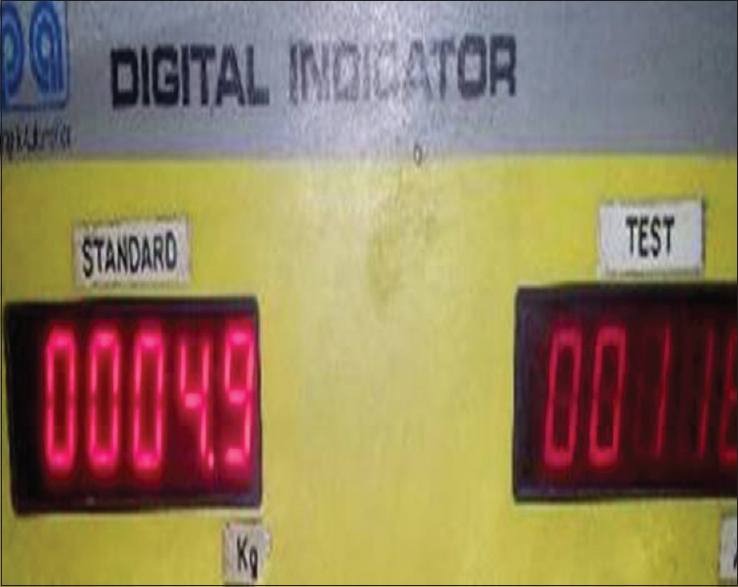 Using a universal testing machine, each of the models were subjected to 100 pulls each to dislodge the overdenture from the acrylic model, and the force values as indicated on the digital indicator were tabulated both before and after thermocycling (AT). Statistical Analysis Used: Statistical analysis comprised Kolmogorov-Smirnov test, Friedman test, and Wilcoxon signed ranks test. Results: The statistical model revealed a significantly different behavior of the attachment systems both before and AT. The ball/o-ring and bar attachments developed higher retentive force as compared to the locator attachment. The bar and clip attachment exhibited the highest peak as well as the highest mean retention force at the end of the study. The Locator ® attachment showed a decrease in retentive potential after an early peak. Conclusions and Clinical Implications: The ball/o-ring and bar and clip attachments exhibit higher retentive capacities than the Locator ® attachment over time. Thus, the aim of this in vitro study was to test the hypothesis that the new unsplinted attachment system experiences less change of retentive force after repeated insertion-removal cycles compared to clinically established splinted attachment systems. The aim of this study was to assess and evaluate the retentive capacity of three most commonly employed attachment systems in implant-retained overdentures. To compare the change in the retentive force of different attachment systems during simulation of insertion-removal cycles. Two implant replicas (CMI) - 3.75 mm diameter, 10 mm length [Figure 1]a.
Acrylic resin mandibular overdentures fabricated with heat polymerized polymethyl methacrylate resin - (DPI Heat Cure, DPI, Mumbai, Maharashtra, India). Surveyor table and metallic clips. Edentulous mandibular models were made from heat polymerized polymethyl methacrylate resin-(DPI Heat Cure, DPI, Mumbai, Maharashtra, India) [Figure 1]b.
Mandibular Overdentures were fabricated in a conventional manner using heat polymerized polymethyl methacrylate resin-(DPI Heat Cure, DPI, Mumbai, Maharashtra, India) [Figure 1]c.
Three overdenture models were prepared and five denture samples were prepared for each group. Group 3 - Locator ® attachment. The implant analogs (CMI 3.75 mm × 10 mm) were placed in the acrylic models using physiodispenser, simulating the conventional placement of implant in osteotomy site in the mandible and subsequently secured with resin cement (Relyx™, 3M ESPE, USA) [Figure 1]b. A metallic housing with a rubber o-ring component was used for the ball and ring attachment. A castable Hader bar of length = 22 mm; diameter = 1.8 mm = 13 gauge. Each attachment system was secured into the implant replicas on the acrylic resin model and the overdentures with the corresponding housing were subsequently placed on it and tightened to 35 Ncm [Figure 3]a-f.
Acrylic overdentures with respective attachment systems were placed on the acrylic edentulous mandibular models. Metallic clips were attached to the dentures and secured with clear autopolymerized acrylic resin (DPI Cold Cure, Clear, DPI, Mumbai, Maharashtra, India). 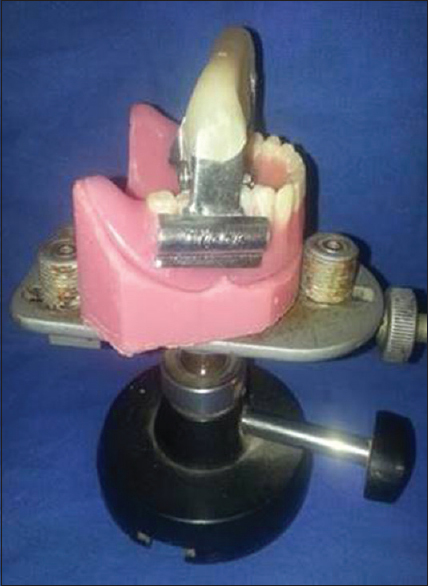 The edentulous acrylic model was secured in place using a surveyor table [Figure 4]. With the UTM (Instron 5567 compression tension tensile meter), each of the models were subjected to 100 pulls each to dislodge the overdenture from the acrylic model, and the force values as indicated on the digital indicator were tabulated [Figure 5] and [Figure 6]. The dislodging force was applied in a vertical direction in the center of the acrylic block joining the two metallic clamps holding the overdenture with the UTM operating at a crosshead speed of 2 mm/30 ms. The readings were taken from the start of the test. 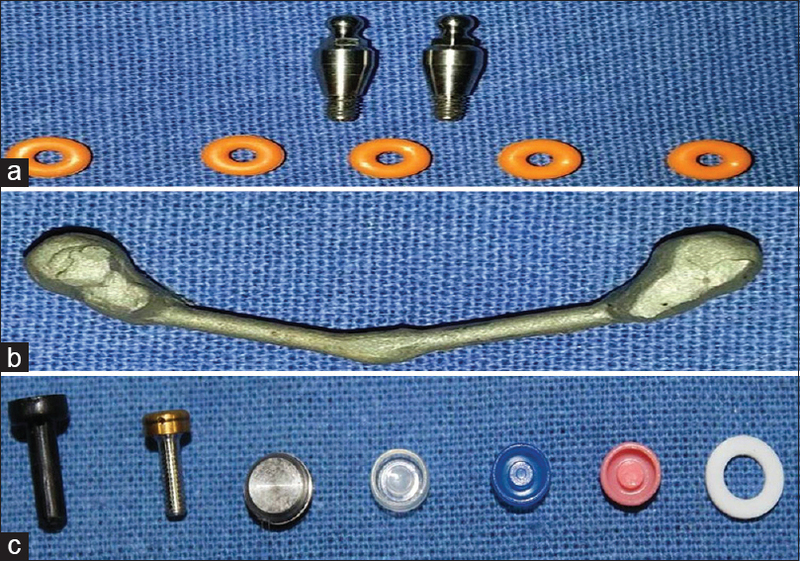 All the overdentures with the attachments placed on the edentulous models were subjected to manual thermocycling using S-U-Polytubs; one maintained at 5 ± 1° and other at 55 ± 1° [Figure 7]. 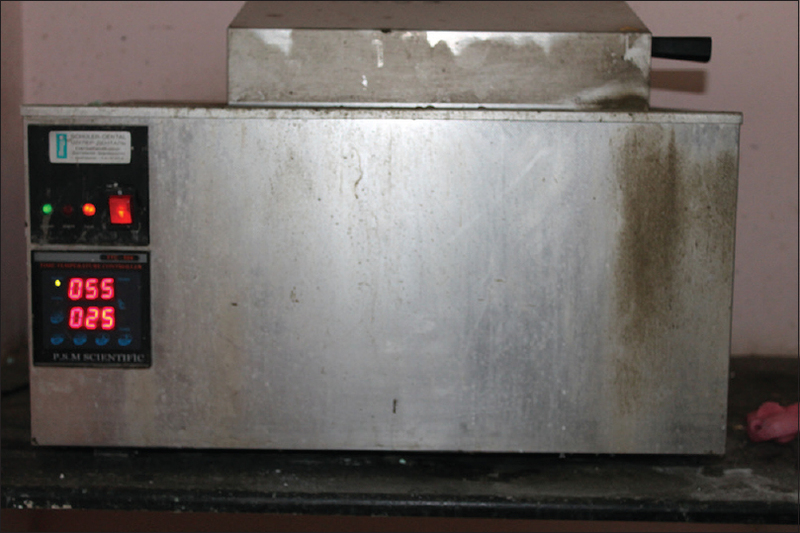 The test samples were subjected to a total of 5000 cycles with each cycle equivalent to 30 s of dwell time in each temperature controlled tub with a transfer time of 10 s, with 5000 thermal cycles being equivalent to 6 months of service in the oral cavity. None of the samples failed. Each of the models was again subjected to 100 pulls each to dislodge the overdenture from the acrylic model and the force values as indicated on the digital indicator were tabulated. The Kolmogorov-Smirnov tests for normality revealed no normal distribution (P < 0.05) for the data; thus, normal distribution was not assumed. Comparison of the repeated measures was performed using Friedman's test showing a statistically significant decrease in concentration. In Group 1, χ2 (1) =30.556, P < 0.001. Post-hoc analysis with Wilcoxon signed-rank test was conducted with a Bonferroni correction applied, resulting in a significance level set at P < 0.001. The mean concentration (± standard deviation [SD]) was 56.26 (9.77) at baseline, 51.30 (5.08) at after thermocycling (AT). 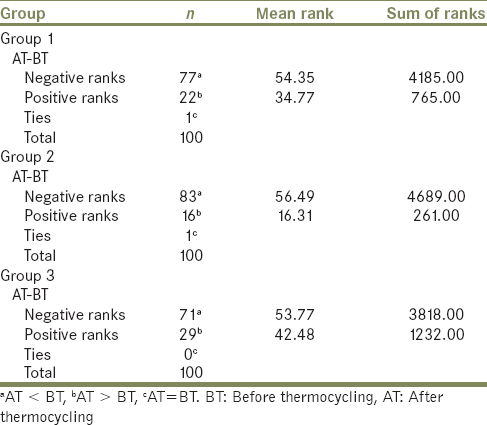 A significant decrease was seen between AT and baseline (Z = −5.969, P < 0.001) after the completion of 5000 thermal cycles [Table 1], [Table 2], [Table 3], [Table 4] and [Table 5]. In Group 2, χ2 (1) =45.343, P < 0.001. Post-hoc analysis with Wilcoxon signed-rank test was conducted with a Bonferroni correction applied, resulting in a significance level set at P < 0.001. The mean concentration (±SD) was 70.66 (12.09) at baseline, 65.18 (10.89) at AT. A significant decrease was seen between AT and baseline (Z = −7.728, P < 0.001) [Table 1], [Table 2], [Table 3], [Table 4] and [Table 5]. In Group 3, χ2 (1) =17.640, P < 0.001. Post-hoc analysis with Wilcoxon signed-rank test was conducted with a Bonferroni correction applied, resulting in a significance level set at P < 0.001. The mean concentration (±SD) was 41.72 (6.53) at baseline, 36.74 (9.32) at AT. A significant decrease was seen between AT and baseline (Z = −4.446, P < 0.001) [Table 1], [Table 2], [Table 3], [Table 4] and [Table 5]. The bar and clip attachment showed the highest mean retentive force of 70.66 N and 65.18 N before and AT, respectively. The maximum retentive force was exhibited by the bar and clip attachment, 82.3 N (cycle no. 56); followed by Locator ® attachment, 66.7 N (cycle no. 41); and ball/o-ring attachment, 65.4 N (cycle no. 13). A decrease in the retention force was observed in all the three attachment systems after subjecting them to thermal cycles and this decrease was found to be statistically significant (P < 0.05). 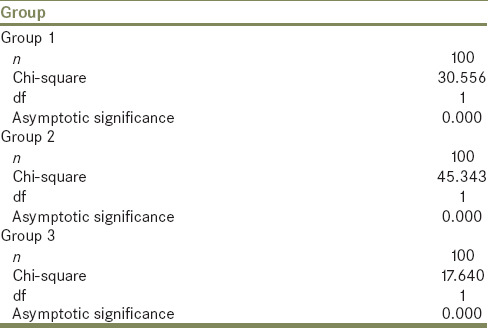 The results obtained are summarized in [Table 6]. Stud type, ball, and conventional bar attachments are the commonly used anchorage systems in implant-supported overdentures and their efficacy is scientifically supported. ,,, Hence, these attachment systems were chosen for this study. During the course of the study, the different attachments showed a complex evolution with peaks as well as increasing and/or decreasing mean retentive forces. The statistical model revealed a significantly different behavior of the attachment systems both before and AT [Figure 8] and [Figure 9]. The ball/o-ring and bar attachments developed higher retentive force as compared to the Locator ® attachments. The bar and clip attachment exhibited the highest peak as well as the highest mean retention force at the end of the study [Table 6]. The Locator ® attachment showed a decrease in retentive potential after an early peak. The ball/o-ring and bar-clip attachments maintain their retentive capacity longer than the Locator ® attachment. A decrease in the retention force was observed in all the three attachment systems after subjecting them to thermal cycles and this decrease was found to be statistically significant. Further research is required to understand the loss in retention force of various overdenture attachment systems. 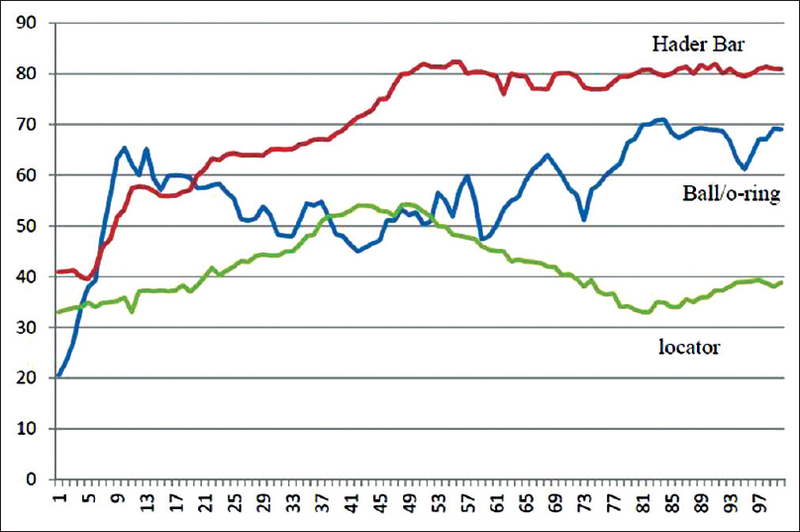 Müller F, Heath R, Ott R. Maximum bite force after the replacement of complete dentures. Gerodontology 2001;18:58-62. Müller F, Naharro M, Carlsson GE. What are the prevalence and incidence of tooth loss in the adult and elderly population in Europe? Clin Oral Implants Res 2007;18 Suppl 3:2-14. Polzer I, Schimmel M, Müller F, Biffar R. Edentulism as part of the general health problems of elderly adults. Int Dent J 2010;60:143-55. Awad MA, Lund JP, Shapiro SH, Locker D, Klemetti E, Chehade A, et al. Oral health status and treatment satisfaction with mandibular implant overdentures and conventional dentures: A randomized clinical trial in a senior population. Int J Prosthodont 2003;16:390-6. Heckmann SM, Heussinger S, Linke JJ, Graef F, Pröschel P. Improvement and long-term stability of neuromuscular adaptation in implant-supported overdentures. Clin Oral Implants Res 2009;20:1200-5. Müller F, Hernandez M, Grütter L, Aracil-Kessler L, Weingart D, Schimmel M. Masseter muscle thickness, chewing efficiency and bite force in edentulous patients with fixed and removable implant-supported prostheses: A cross-sectional multicenter study. Clin Oral Implants Res 2012;23:144-50. Rutkunas V, Mizutani H, Takahashi H, Iwasaki N. Wear simulation effects on overdenture stud attachments. Dent Mater J 2011;30:845-53. Evtimovska E, Masri R, Driscoll CF, Romberg E. The change in retentive values of locator attachments and hader clips over time. J Prosthodont 2009;18:479-83. Alsabeeha NH, Payne AG, Swain MV. 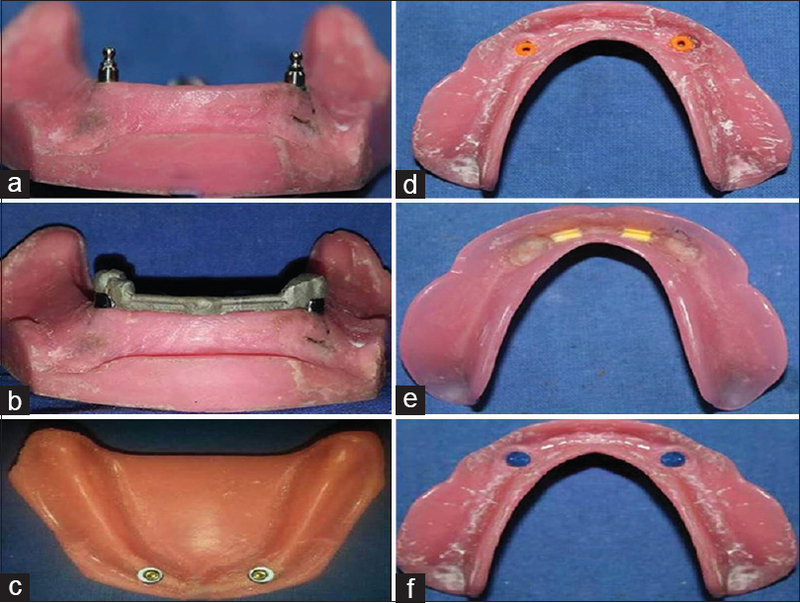 Attachment systems for mandibular two-implant overdentures: A review of in vitro investigations on retention and wear features. Int J Prosthodont 2009;22:429-40. Payne AG, Solomons YF. Mandibular implant-supported overdentures: A prospective evaluation of the burden of prosthodontic maintenance with 3 different attachment systems. Int J Prosthodont 2000;13:246-53. Gotfredsen K, Holm B. Implant-supported mandibular overdentures retained with ball or bar attachments: A randomized prospective 5-year study. Int J Prosthodont 2000;13:125-30. Büttel AE, Bühler NM, Marinello CP. Locator or ball attachment: A guide for clinical decision making. Schweiz Monatsschr Zahnmed 2009;119:901-18. 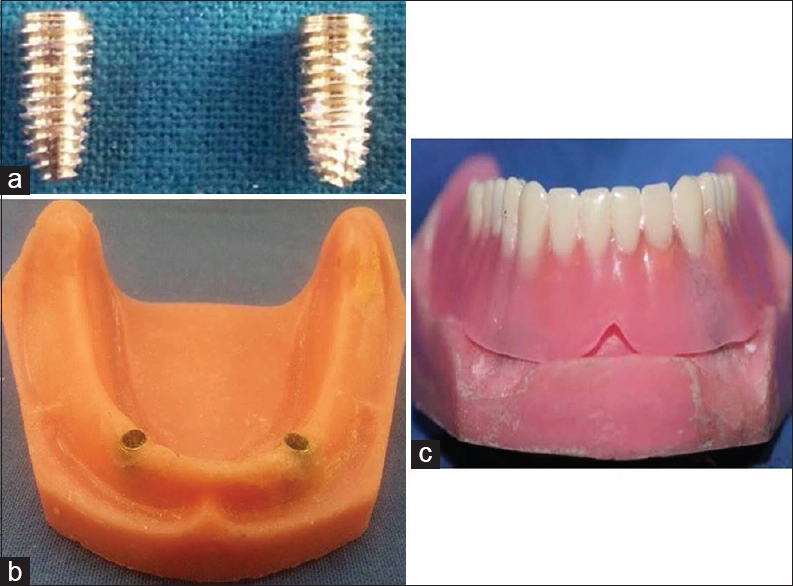 Kleis WK, Kämmerer PW, Hartmann S, Al-Nawas B, Wagner W. A comparison of three different attachment systems for mandibular two-implant overdentures: One-year report. Clin Implant Dent Relat Res 2010;12:209-18. Ludwig K, Cretsi X, Kern M. In vitro retention force changes of ball anchor attachments depending on divergences of implants. Dtsch Zahnarztl Ztg 2006;61:142-6. Bayer S, Keilig L, Kraus D, Grüner M, Stark H, Mues S, et al. 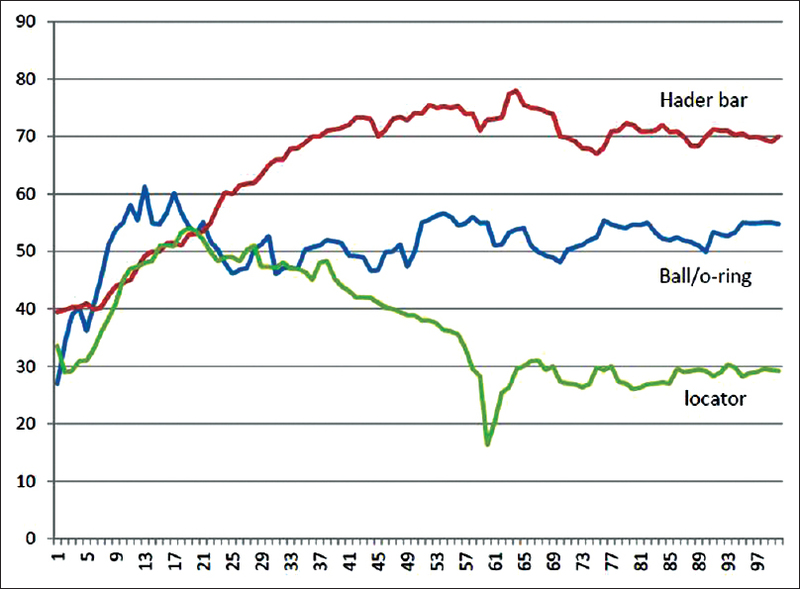 Influence of the lubricant and the alloy on the wear behaviour of attachments. Gerodontology 2011;28:221-6. Rutkunas V, Mizutani H, Takahashi H. Evaluation of stable retentive properties of overdenture attachments. Stomatologija 2005;7:115-20. 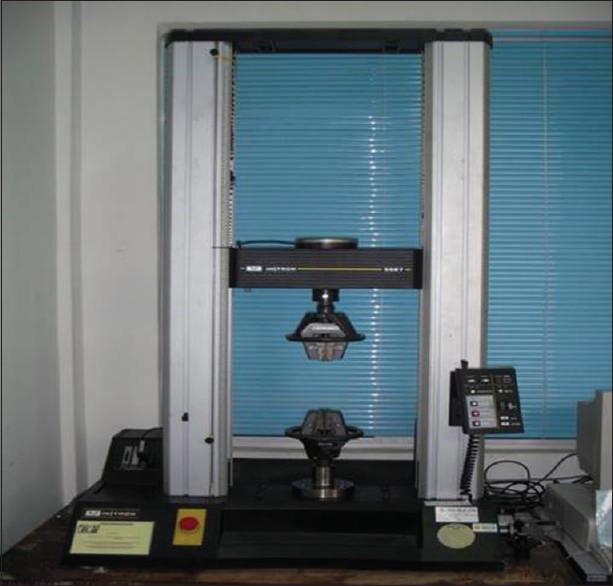 Yao J, Li J, Wang Y, Huang H. Comparison of the flexural strength and marginal accuracy of traditional and CAD/CAM interim materials before and after thermal cycling. J Prosthet Dent 2014;112:649-57. Doundoulakis JH, Eckert SE, Lindquist CC, Jeffcoat MK. The implant-supported overdenture as an alternative to the complete mandibular denture. J Am Dent Assoc 2003;134:1455-8. Cune M, van Kampen P, van der Bilt A, Bosman F. Patient satisfaction and preference with magnet, bar-clip, and ball-socket retained mandibular implant overdentures: A cross-over clinical trial. Int J Prosthodont 2005;18:99-105. Naert I, Gizani S, Vuylsteke M, Van Steenberghe D. A 5-year prospective randomized clinical trial on the influence of splinted and unsplinted oral implants retaining a mandibular overdenture: Prosthetic aspects and patient satisfaction. J Oral Rehabil 1999;26:195-202. Karabuda C, Yaltirik M, Bayraktar M. A clinical comparison of prosthetic complications of implant-supported overdentures with different attachment systems. Implant Dent 2008;17:74-81. Cakarer S, Can T, Yaltirik M, Keskin C. Complications associated with the ball, bar and Locator attachments for implant-supported overdentures. Med Oral Patol Oral Cir Bucal 2011;16:e953-9. Kobayashi M, Srinivasan M, Ammann P, Perriard J, Ohkubo C, Müller F, et al. Effects of in vitro cyclic dislodging on retentive force and removal torque of three overdenture attachment systems. Clin Oral Implants Res 2014;25:426-34. Steiner M, Ludwig K, Kern M. Retention forces of a new implant-supported bar attachment system. Clin Oral Implants Res 2009;20:1025-6. Wiskott H. Bioengineering applied to oral implantology. Biomechanical studies. In: Ballo A, editor. Implant Dentistry Research Guide: Basic, Translational and Clinical Research. 1 st ed. Hauppauge, NY, USA: Nova Science Publishers; 2012. p. 369-426. Yang TC, Maeda Y, Gonda T, Kotecha S. Attachment systems for implant overdenture: Influence of implant inclination on retentive and lateral forces. Clin Oral Implants Res 2011;22:1315-9.